Introducing Apple Card, a new kind of credit card created by Apple<br/>Built on Simplicity, Transparency and Privacy, and Designed to Help Customers Lead a Healthier Financial Life<br/>Cupertino, California — Apple today announced <a href="https://www.apple.com/apple-card/" target="_blank">Apple Card</a>, an innovative, new kind of credit card created by Apple and designed to help customers lead a healthier financial life. Apple Card is built into the Apple Wallet app on iPhone, offering customers a familiar experience with Apple Pay and the ability to manage their card right on iPhone. Apple Card transforms the entire credit card experience by simplifying the application process, eliminating fees, encouraging customers to pay less interest and providing a new level of privacy and security. Available in the US this summer, Apple Card also offers a clearer and more compelling rewards program than other credit cards with Daily Cash, which gives back a percentage of every purchase as cash on customers’ Apple Cash card each day. <br/>Customers can sign up for Apple Card in the Wallet app on their iPhone in minutes and start using it with Apple Pay right away in stores, in apps or online worldwide. Apple Card gives customers easy-to-understand, real-time views of their latest transactions and balance right in Wallet, and Apple Card support is available 24/7 by simply sending a text from Messages. <br/>Apple Card uses machine learning and Apple Maps to clearly label transactions with merchant names and locations. Purchases are automatically totaled and organized by color-coded categories such as Food and Drinks, Shopping and Entertainment. To help customers better understand their spending, Apple Card provides weekly and monthly spending summaries. <br/>Customers will receive a percentage of every Apple Card purchase amount back as Daily Cash. Unlike other cash back rewards, Daily Cash is added to customers’ Apple Cash card each day and can be used right away for purchases using Apple Pay, to put toward their Apple Card balance or send to friends and family in Messages. Every time customers use Apple Card with Apple Pay, they will receive 2 percent Daily Cash. Customers will also get 3 percent Daily Cash on all purchases made directly with Apple, including at Apple Stores, on the App Store and for Apple services. 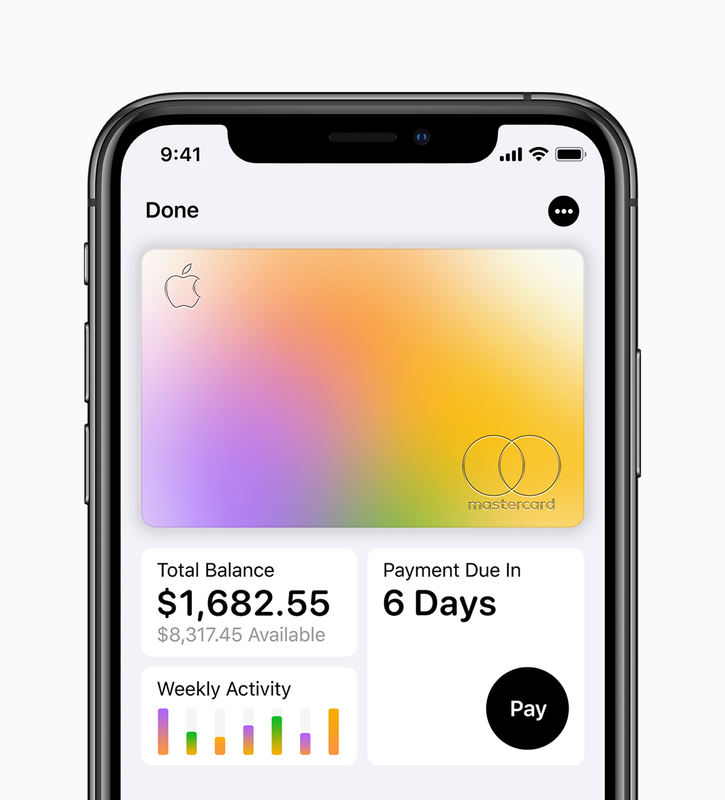 <br/>To help customers make informed choices, Apple Card shows a range of payment options and calculates the interest cost on different payment amounts in real time. As a way to pay less interest, Apple Card will also suggest paying a bit more every month and offers the flexibility to schedule more frequent payments. <br/>A unique card number is created on iPhone for Apple Card and stored safely in the device’s Secure Element, a special security chip used by Apple Pay. Every purchase is secure because it is authorized with Face ID or Touch ID and a one-time unique dynamic security code. The unique security and privacy architecture created for Apple Card means Apple doesn’t know where a customer shopped, what they bought or how much they paid. <br/>Apple is partnering with Goldman Sachs and Mastercard to provide the support of an issuing bank and global payments network. As a newcomer to consumer financial services, Goldman Sachs is creating a different credit card experience centered around the customer, which includes never sharing or selling data to third parties for marketing and advertising. Mastercard will provide cardholders the ability to shop at merchants around the globe. <br/>“We are excited to be the global payments network for Apple Card, providing customers with fast and secure transactions around the world,” said Ajay Banga, president and CEO of Mastercard. <br/>Apple has also designed a titanium Apple Card for shopping at locations where Apple Pay is not accepted yet. With no card number, CVV security code, expiration date or signature on the card, Apple Card is more secure than any other physical credit card. All this information is easily accessible in Wallet to use in apps and on websites. For purchases made with the titanium Apple Card, customers will get 1 percent Daily Cash. <br/>US customers can now sign up for the latest news about Apple Card on <a href="https://www.apple.com/apple-card/" target="_blank">apple.com/apple-card</a>. Apple Card will be available to qualified customers in the US this summer.